Westmead Hospital’s dermatology team. Left to right: Medical officer Dr Rose Liu, research fellow Dr Linda Chan, department director Associate Professor Dr Pablo Fenandez-Penas, honorary fellow Dr Germana Romero and administration officer (clinical trials), Rupalben Patel. 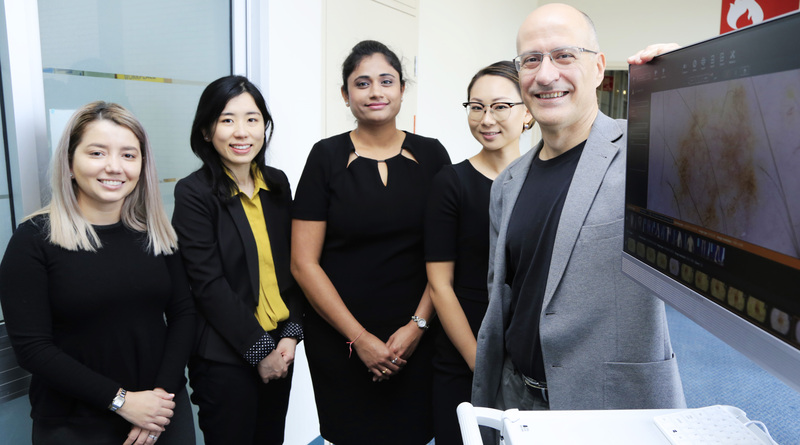 Westmead Hospital’s dermatology department has today been selected to receive a state-of-the-art imaging machine that can complete a 3D whole body scan in just seconds. It is just one part of a $10 million nation-wide fight against Australia’s most common cancer, with major universities, research and health centres uniting to tackle the disease. Left to right: Dr Germana Romero, Dr Linda Chan, Rupalben Patel, Dr Rose Liu and Dr Pablo Fenandez-Penas. The $469,400 machine to be installed at Westmead is one of 15 scanners that will be installed across Queensland, New South Wales and Victoria. The 3D imaging system will significantly improve lesion identification and tracking, while greatly reducing appointment times and healthcare costs. It is estimated the machines will be able to provide 3,000 examinations each year. Dermatology department director Professor Pablo Fernandez Penas said he was thrilled his team was selected to receive the state-of-the-art machine. “Westmead Hospital was chosen because we have one of the most important high risk melanoma clinics in NSW,” Prof Fernandez Penas said. “We have a lot of patients that require full body photography system to follow their skin lesions. The grant will see the introduction of the Australian Cancer Research Foundation (ACRF) Australian Centre of Excellence in Melanoma Imaging and Diagnosis, which will be led by University of Queensland’s (UQ) Diamantina Institute and in collaboration with the University of Queensland, the University of Sydney, Monash University and state-based research and health partners. The grant announcement was made at a reception hosted by the Governor General of the Commonwealth of Australia, His Excellency General the Honourable Sir Peter Cosgrove AK MC (Retd) and Lady Cosgrove, at Admiralty House in Sydney. UQ Dermatology Research Centre director Professor H. Peter Soyer said the centre would combine cutting-edge 3D imaging technology with telemedicine work. “Melanoma is Australia’s national cancer with Australians experiencing 12 times the global incidence,” Professor Soyer said.